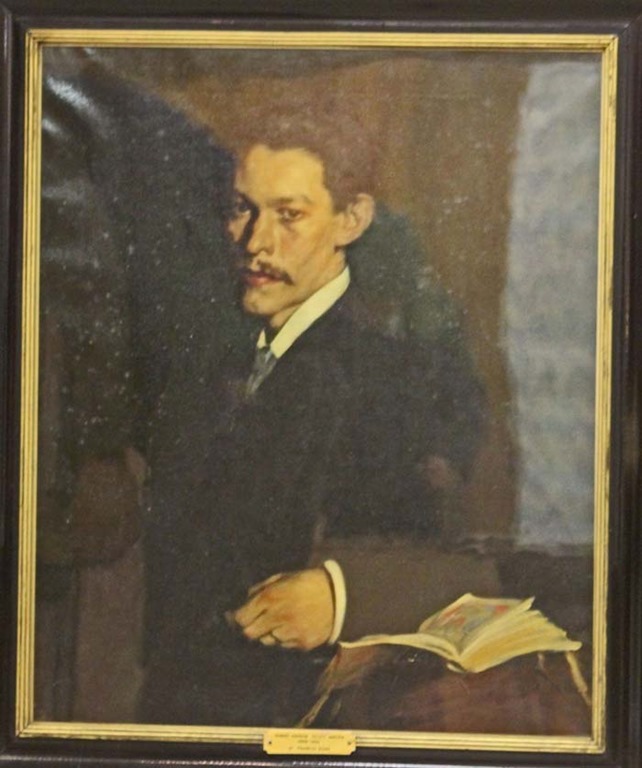 A painting of R.A. Scott Macfie, whose collection of books is at the Dales Countryside Museum (DCM) in Hawes, has been presented to the museum. Photographed at the presentation are: on the left Bob Ellis, on the right side of the photograph, Mora Main, and on the far right Eleanor Scarr. Macfie collected many books and documents while he was living at Lunds in the 1920s and early 1930s and these now form part of the Macfie Calvert Collection.This is housed at the DCM in trust to the people of Wensleydale and cared for by the Trustees of the Macfie Calvert Collection. The stormy weather and floods on Saturday March 16 did not stop 27 family members and the godson of Macfie gathering at the museum. The special guest at the gathering was 92-year-old Arthur Ashton, Scott Macfie’s godson, who lived on High Hall farm at Lunds a mile away from Macfie’s home. Arthur remembers Macfie well even though he was only eight when he attended his godfather’s funeral and burial at Lunds chapel in 1935. There were 12 great nephews and nieces of “Uncle Scott” at the gathering, plus great great nephews and nieces and one very young great great great niece. 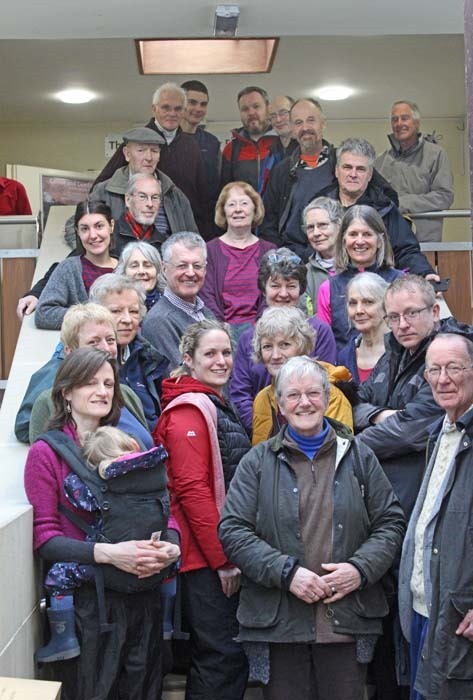 The gathering came about due to a chance encounter between some family members, John and Diane Elphinstone, and Bob Ellis who is a Friend of the DCM. When the Elphinstones were searching for a home in Clapham in 2009 they attended one of Bob’s lectures about watermills. Afterwards they discovered the connection between John, who is a great nephew of Macfie and Bob’s custodial role with the Macfie Calvert Trust. 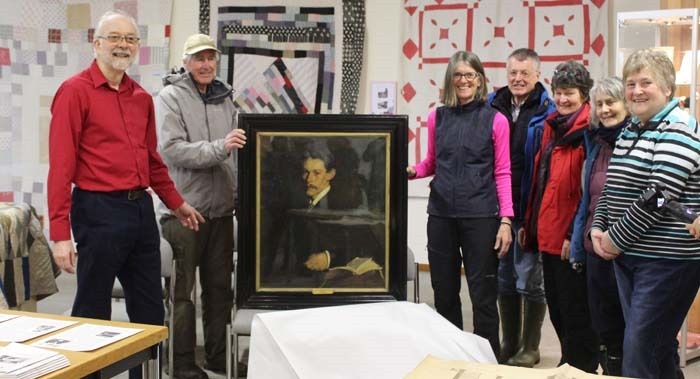 Simultaneously a great niece, Mora Main, was cleaning out stored family items from her brother’s Perthshire garage and uncovered the portrait of Uncle Scott by renowned artist Francis Dodd. Dodd had worked in Manchester and London and was later an official WWI British war artist. Mora then began searching for a safe new home where the portrait could be hung and be accessible for future researchers. The portrait had belonged to her father, the late Ramsay Main. Ramsay and his twin sister, Barbara (John Elphinstone’s mother) had held their Uncle Scott in high regard. It was John’s sister Janet who successfully contacted so many Macfie descendants to attend the gathering. At the gathering Bob and fellow trustees of the Macfie Calvert Collection, Eleanor Scarr and Mary Scarr, officially received the painting on behalf of the museum. The Macfie/Elphinstone family also made a donation of £305 to the Macfie Calvert Trust. Bob said this will be used to restore the portrait . When it has been restored it will be displayed on a wall in the Research Room in the museum,” he added. Macfie was the son of a sugar magnate from Liverpool. Bob recounted in his article for the 2014 edition of Now Then (the annual magazine of the FDCM ) that after serving on the Western Front with the Liverpool Scottish Regiment during WW1 Macfie moved to the Lunds in the 1920s with the hope that the clean bracing air would prove beneficial to his precarious health. He bought Shaws, an isolated house on the fellside behind Lunds Chapel, and lived there until his death in 1935. “During his years at Shaws, he became very involved with the local community and developed a passionate interest in the culture and history of upper Wensleydale, Mallerstang and the surrounding dales. As a result he amassed a large collection of books of local interest,” wrote Bob. For a while Macfie’s books and those of Kit Calvert were in the care of the Wensleydale School and later were moved to the DCM. At present the Research Room at the museum is being damp proofed and re-decorated. When that work is complete the Macfie Calvert collection of books will be moved back into the glass-fronted cabinets and store room there. Bob plans to exhibit the tea service presented by the Macfie/Elphinstone family in one of those cabinets. The tea service has the family crest on it and the legend “R.A. Scott Macfie, Shaws, Lunds”. The family also presented other artefacts, books and documents to the museum. There are Friends of the DCM in the Research Room on Mondays and Wednesdays to assist anyone who is researching family or history connected to upper or mid Wensleydale. Above: the family gathering. Arthur Ashton is wearing a flat cap. Below: The portrait of Scott Macfie.